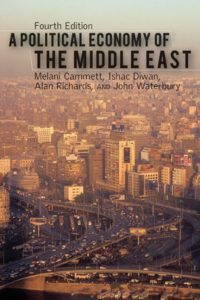 The fourth edition of A Political Economy of the Middle East is a substantially revised and updated version of this classic text originally authored by Alan Richards and John Waterbury. The new edition includes a new framework for understanding politics, economics and the intersection between the two across the entire Middle East. Existing chapters are updated and rewritten while new chapters are included. A link to the book website is available here. Ithaca, NY: Cornell University Press, 2014. In the Middle East and elsewhere in the Global South, ethnic and religious groups provide social welfare alongside or in the place of states. Compassionate Communalism analyzes sectarianism through the lens of social welfare. 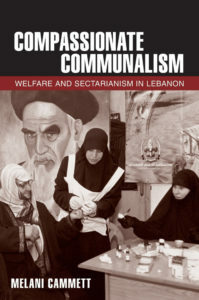 Focusing on health care, education and material assistance, the book compares the welfare distribution strategies of Christian, Shia Muslim, and Sunni Muslim political parties in Lebanon, where social service provision is a terrain of political contestation. Brief additional case studies of the Sadrist Movement in Iraq and the Bharatiya Janata Party in India complement the in-depth research on Lebanon. Why do some “sectarian” providers distribute welfare goods broadly, even to non-coreligionists, while others allocate services more narrowly? Based on extensive field research and diverse forms of quantitative and qualitative data, this research unpacks the political logics of service provision by sectarian organizations. Non-state welfare performs a critical function in the absence of capable state institutions but it comes at a price. When partisanship and ethnic or religious identity mediate access to welfare, social divisions and inequalities can emerge or become further entrenched. Beyond caring for the needy, service provision by sectarian groups may also sustain competing visions of the polity and introduce new dimensions of social inequalities. The research for this book was supported by grants from the Smith Richardson Foundation, U.S. Institute of Peace, Academy Scholars Program of the Weatherhead Center for International Affairs at Harvard University, and Salomon Faculty Research Grant at Brown University. Here are the Table of Contents, Introduction, and Chapter 1 of Compassionate Communalism. Compassionate Communalism won the 2015 Giovanni Sartori Book Award of the APSA Section on Qualitative and Mixed Methods and the Honorable Mention for the 2015 Gregory Luebbert Book Award of the APSA Section on Comparative Politics. An article based on this research won the 2011 Alexander L. George Award of the APSA Qualitative and Mixed Methods Research Section. Throughout the world, non-state social welfare is on the rise. 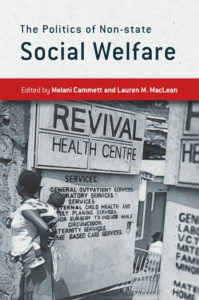 This edited volume addresses the political consequences of social welfare provision by diverse types of international and domestic non-state actors, including for-profit firms, NGOs, religious charities, political parties, communal groups, informal brokers and family networks, among others. (See the table of contents here.) In the Introduction and Chapter 2, we develop an analytical framework for assessing the effects of non-state welfare provision on access to services, experiences of citizenship, and state capacity. In the Conclusion, we evaluate the framework in light of empirical evidence from chapters in the volume on distinct provider types from countries in diverse global regions. In Chapter 7, I discuss the social and political consequences of welfare provision by sectarian parties. The book received the Honorable Mention for the 2015 Outstanding Book in Nonprofit and Voluntary Action Research of the Association for Research on Nonprofit Organizations and Voluntary Action (ARNOVA). 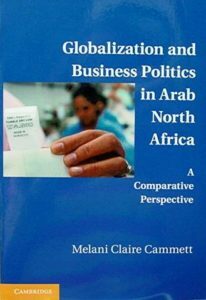 This book analyzes when and how business groups in developing countries mobilize collectively in response to global economic pressures and examines how different patterns business-government linkages affect processes of industrial upgrading. The central claim is that the historical development of business-government relations shapes business responses to globalization. Both the balance of power between business and the state before economic opening and business class structure combine to form different patterns of business-government relations, which range from collusive and collaborative to more distant. New incentives from globalization interact with distinct patterns of business-government relations to produce varied types of business mobilization in the face of economic change. In countries with distant business-government relations, economic liberalization engenders less pronounced domestic struggles. In countries with collusive business-government relations, however, new export-oriented business factions organize against protected economic elites, compelling them to create well-structured business lobbies.